There was a discussion a few years back on the pressure cooker group on Yahoo! about pictures with recipes. To some folks it really makes a difference. To others it’s not so important. For me, I like to have pictures with my recipes. If I’m adding a recipe to my database from a place like myrecipes.com (where the recipes from most of the Time-Life mags live: Cooking Light, Sunset, Coastal Living, etc.) I make sure to download and include the picture. If the recipe is from a print publication and is not available online, I scan both the recipe and the photo if there is one. Somehow my presentation is never like what is portrayed in the picture. Still, the photo helps to give me a sense of what I should be trying to get to. I complained rather bitterly here when Gary Trudeau stopped doing new Doonesbury comics and his syndicate began doing reruns of the earliest strips. But you know what? I’m enjoying them. The strip was much more crudely drawn in those early days, but the humor is sharp. More importantly, the content reflects the values of the 1970’s. I loved the 1970’s when I was there. I still love the 1970’s. So I’m really getting a kick out of those old Doonesbury strips. Did I tell you how much I love the 1970’s? Images from times I look back upon with nostalgia are a sure way to get me hooked on a new novel. 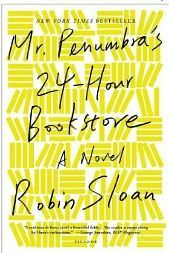 Mr. Penumbra’s 24-Hour Bookstore had two of those at the outset. There was the image of ladders on rails along the walls of a bookstore. And there was the description of an ancient Mac used to manage customer accounts in the store. The first took me back to my days at B. Dalton Bookseller in the mid and late 1970’s and early 1980’s. The second reminded me of our local used book store in Mountain View in the late 1990’s. Those images sucked me in, but the plot and the writing kept me engaged. The narrator is a graphic designer in San Francisco who found himself unemployed when his startup went bust. He finds a job in a strange used bookstore which turns out to be a front for a secret society. That society, we learn later, is engaged in trying to untangle a code left by one of the pioneers from the early days of the printing press and typeface design. We also get a picture of the culture inside Google, down the peninsula in that same Mountain View where my used bookstore was. Google culture, as the author sees it, is every bit as much a cult as is the secret society at the bookstore. Mr. Penumbra’s 24-Hour Bookstore says a lot about our values and priorities. It was entertaining and thought-provoking. What more can one ask of a novel? 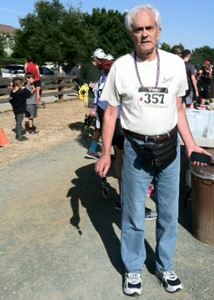 Terry and I walked the Mushroom Mardi Gras 5k on Saturday. This was no small matter. Saturday is my one day for sleeping in. And I really love taking advantage of this time. 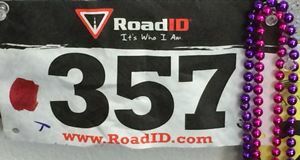 To get to the race location, get parked, and get registered for the 8:05 start (the 10k began at 8:00), we had to get out of bed at 6:15. On a Saturday. But we had both registered in advance and paid our money. 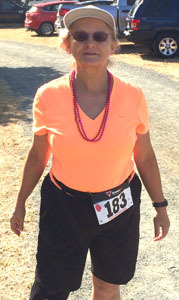 We had both been training, and I had done two walks in excess of 5k over the past month. So we did it. We were near the end of the pack, but that was fine. It was a nice walk along a pleasant trail, and we enjoyed it. There is something rewarding about making a commitment and following through.